(Captain America: The Great Gold Steal (fb)) <1912> - A man saw a troll--or what he believed was a troll--in the Manhattan subways. Due to prevailing superstition, that portion of the subway--running under Liberty Street by Liberty Place--was forever closed off. (Captain America: The Great Gold Steal (fb)) - A man known only as the Eagle arranged a group--Raven, Sparrow, Starling, Monk--to steal the 13 billion dollars worth of gold from the New York Federal Reserve Bank via a tunnel created from the abandoned subway. Monk had second thoughts, and he cut a piece of gold from one of the bars, intending to take it and the US seal it contained to Captain America to warn him of the plot. Starling learned of Monk's activities but incorrectly assumed that he was planning on selling information to other criminals. Starling informed the Eagle. (Captain America: The Great Gold Steal) - The Eagle's agents shot Monk with a laser before he could reach his goal, and Captain America rushed to his side just as he died, revealing only a piece of gold. Captain America, however, knew that gold taken outside the reserve under legal means would have had that seal removed. Meanwhile, the Eagle's agents began stealing gold from the reserve. Captain America visited and questioned the New York Federal Reserve Bank's Vice Director, John B. Gaughan, who initially denied that such theft was even possible until Captain America showed him the gold and its seal. Investigating the vault itself, Captain America discovered evidence of the tunneling. Captain America followed the trail to the thieves' temporary living quarters, defeating the single guard left behind. Using the phone from the room, Captain America contacted Starling, who blew up the office in order to stop him. Having only escaped with one million dollars, Starling shot and killed a guard (Ray Thompson) while escaping. Captain America was buried alive, but dug himself to safety before passing out. At least two bank guards were killed. Starling met up with another agent, Raven, to discuss further plans, but the Eagle contacted him and instructed him to capture Captain America. Working with Chicago-borrowed hoods Randolph and Marcus, Starling used Robin to lure Captain America into a trap. She pretended to have information on the thieves and then nailed Captain America with a gas gun, allowing Randolph and Marcus to beat him into submission and capture him. Captain America was taken hostage, bound, and left under Robin's guard, but Cap convinced Robin to turn against the other criminals--by telling her how hard it would be to use the gold they had stolen and how she would be an accomplice to murder--and to untie him. Meanwhile Sparrow led the other men in blowing up Manhattan's main power plant, killing guard Ralph Amberson to gain entry. Back-up power came on almost instantly, but the criminals destroyed that with their laser, causing a blackout over the lower two-thirds of Manhattan. They then returned to their tunnel into the Reserve, loading their trucks with as much gold as they could before heading to the Eagle's Staten Island retreat. They escaped with a couple billion dollars worth of gold, but the returning Captain America spotted a large truck leaving Liberty Street, its tires flattened from its heavy load. Captain America followed the vehicles out to Staten Island where he confronted them, confirming his suspicion that Sparrow was John B. Gaughan. Sparrow then revealed to the others that he was actually the Eagle, as well. Captain America told him to pull out all of the stops, and Sparrow then pulled off his mask, revealing himself to be the Red Skull, now working as a free agent. Captain America shot Starling, at which point Raven surrendered. The Red Skull stated that Captain America would not shoot an unarmed man, but Marcus then shot the Red Skull, stating death to be the price of failing his employers (Soviet agents?). The Red Skull--shot in the shoulder--nonetheless escaped into a waiting boat, but the Coast Guard was on hand to stop him. As he tried to flee, they blew up his ship. No body was found. Comments: Created by Ted White, published by Bantam Books. The character of Andrew "Monk" Mayfair is likely named in honor of chemist Andrew Blodgett "Monk" Mayfair, an associate of Doc Savage from the old "Doc Savage" pulp stories. (Captain America: The Great Gold Steal (fb)) <July 19, 1917> - Steve Rogers had a difficult birth. (Captain America: The Great Gold Steal (fb)) - His mother died soon afterward, leaving him in the care of his father and seven year old brother, Alan. (Captain America: The Great Gold Steal (fb)) <1918> - His father died during World War I. (Captain America: The Great Gold Steal (fb)) - Steve and his brother spent the next ten years being lovingly raised by their Uncle Charlie and their aunt. Rugged, handsome, and popular, Alan excelled at sports and school, twice serving as class president. However, Steve was tall, thin, and gangling, a weak, nervous child who hid out in books. Steve twice suffered tuberculosis during his childhood, spending an entire year confined to his bed at age six, and then he nearly died at age ten. Uncle Charlie was wiped out by the panic of 1929, and the boys were separated. At the age of twelve, Steve was sent to an orphanage. Retreating from the taunts of peers ever deeper into books, Steve graduated high school an honor student. With a state scholarship, Steve studied law at Columbia. (Captain America: The Great Gold Steal (fb)) - <1940> As Europe warred against Hitler, Steve went to the draft board to enlist, but was laughed away. However, his determination and intellect impressed the recruiters, and a few months later Steve was one of 20 men approached by FBI agents Richard W. Brown and Michael McInerney to participate in Operation: Rebirth. After a rigorous testing process, he met with Brigadier General Anderson who discussed Dr. Anton Erskine's experiments and their risks, then took him to a secret laboratory in Manhattan's Lower East Side. Steve's bones were strengthened via stainless steel-slotted tubes inserted into the marrow; his diet was heavily weighted with calcium as a series of chemical treatments made the bones themselves stronger and more durable; he gained three inches in height; for days he was fed large, high-protein meals while engaging in rigorous exercise; and over-time his physique became that of a veritable Greek god. He next received an injection that caused him to enter into a trance-like state while his body taught itself to increase its metabolism and reflexes; he also gained awareness and control over his autonomic nervous system and over the function of every part of his body. At the conclusion of the experiments--a resounding success, Steve's former trainer, Max, revealed himself to be a Nazi agent who slew Erskine before being stopped by Rogers. Having taken three gunshots in the process, Rogers swiftly stopped the bleeding, prevented any infection, and sped up the healing. 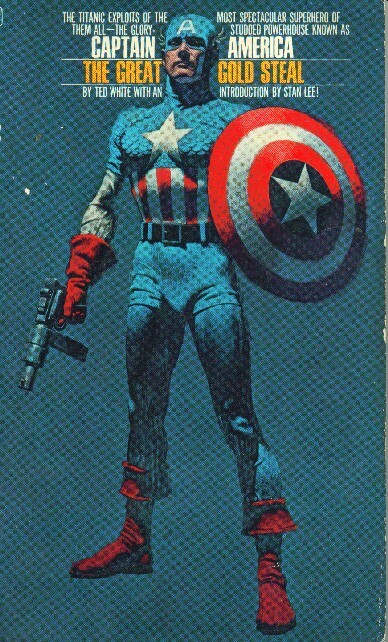 (Captain America: The Great Gold Steal (fb)) - Anderson soon commissioned Rogers as Captain America, who acted across the USA's East Coast (fighting such foes as the Red Skull), until the US entered World War II, at which point he joined the army as Private Steve Rogers and took the teenage sidekick partner Bucky Barnes. In 1945, Bucky was apparently slain while trying to diffuse launched V-2 "buzzbombs," while Captain America was sent into suspended animation, frozen below the waters of the North Atlantic. In 1963, his frozen form was found and recovered by the modern day heroes known as the Avengers; revived, he soon joined them. (Captain America: The Great Gold Steal) - The other current Avengers--the Scarlet Witch, Quicksilver, and Hawkeye--otherwise indisposed, Captain America investigated the Great Gold Steal on his own. Exceptionally, if not superhumanly, strong, Captain America's bones are more durable and bolstered by steel rods within the marrow. His entire genetic pattern was imprinted on every cell of his body, and Dr. Erskine believed that they could reconstruct him from a single cell. He has superhuman reflexes and metabolism, as well as awareness and control over his autonomic nervous system and over the function of every part of his body. He can stop himself from bleeding and consciously guide the healing process. However, performing thusly is a tremendous drain on his system, and he will lose weight rapidly as his body burns up his energy stores, and he must feast to replenish them. A master combatant, he used a virtually indestructible circular shield which he could throw in such a fashion that it would return to his hands after striking its target.